The British Gazette » Shooting oneself in the foot! Today I received an email from a UKIP member advising me that Parliament is set to debate the petition: ‘Leave the EU immediately’ on Monday 22nd January 2018. Leave the EU immediately; and not via Article 50? You might be a turkey voting to have Christmas 2018 brought forward eleven months to say Thursday 25th January, 2018 but I’m NOT! If you want to go up to London to make a fool of yourself, that is your democratic right, but I will not be accompanying you! It appears however that the UKIPers attending any demonstrations outside the Houses of Parliament will not be the only turkeys voting for an early Christmas! This is because they are joined by another, from the other side of the pond! Although this turkey will be voting for an early Thanksgiving! This particular turkey glories under the title of Mayor of New York City. 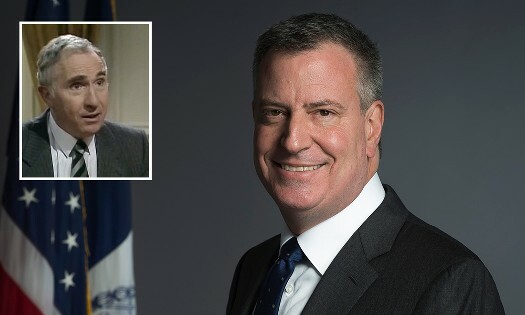 He is one Bill de Blasio (formerly called Warren Wilhelm Jr.). He is the current and 109th Mayor of New York City having assumed office on 1st January, 2014 succeeding Mayor Michael Bloomberg. This is because Mr de Blasio intends to sue BP, Chevron, Conoco-Phillips, Exxon-Mobil and Royal Dutch Shell for the effects of global warming! This is of course due to the fact that IF pursued this litigation will result in the oil companies defending themselves against a potential liability that could bankrupt them and consequentially the “scientific” claims of the glow-bull-warnists will be put under the judicial microscope! The defendants in Mayor de Blasio’s federal lawsuit are; BP, Chevron, Conoco Phillips, Exxon Mobil and Royal Dutch Shell. NB: Declaration of interest: I own a considerable number of shares in Royal Dutch Shell.